Trump Attorney General nominee Bill Barr: Swamp master or destroyer? As originally published at Foxnews.com. Will Democrats find a way to obstruct his confirmation or will it be smooth sailing? GOP strategist Chris Turner weighs in. The Senate Judiciary Committee opens its confirmation hearing Tuesday for former Attorney General William Barr to become attorney general again. Is there no one eligible to become the next attorney general who doesn’t have a more than 25-year personal relationship with Special Counsel Robert Mueller? Mueller is investigating whether President Trump or his associates conspired with Russia during the 2016 presidential campaign to help Trump get elected. Barr, who is expected to win Senate confirmation to become attorney general in the Trump administration, would become Mueller’s supervisor if confirmed. Senate Judiciary Committee Chairman Lindsey Graham, R-S.C., revealed that Barr worked with Mueller when Barr previously served as attorney general from 1991 to 1993 under President George H.W. Bush. But on top of that, the two were “best friends” and their wives attended Bible study together. This came as stunning news to many conservatives, who had hoped that Barr would rein in the out-of-control special counsel. When added to the knowledge that Mueller had attended the weddings of Barr’s children, it is clear that Barr’s relationship with the special counsel is extremely close. I’m shaking my head in almost stunned disbelief. Was there no one in America who could have been appointed who isn’t Mueller’s BFF? There can be no doubt that William Barr is as qualified of a nominee as can be imagined, having already served in the capacity of attorney general in the past and being one of the most respected conservative attorneys in Washington over the past two decades. The nominee even cautioned that Special Counsel Mueller should be very careful before constructing any obstruction charge against the president based on perceived motivations rather than defined acts, because the charge itself could lead to other unintended consequences that would undermine the administration of justice. Hopefully, President Trump has found the honest man who not only can shine a light on the corruption within the Justice Department but also has the guts and the legal gravitas to do something about it, becoming the swamp’s worse nightmare. Barr wrote this as someone who had held not only the role of attorney general, but also deputy attorney general – the same job that is currently held by the Rod Rosenstein, who is reviled by many conservatives. 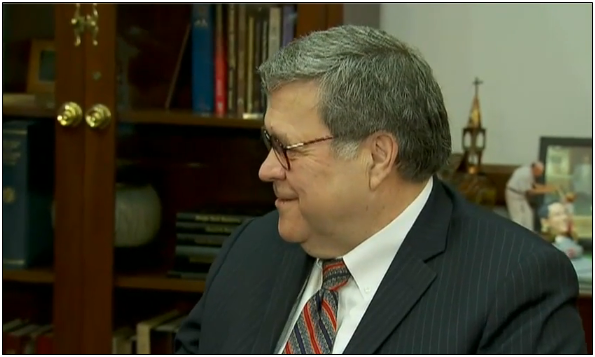 Barr also served as the head of the Office of Legal Counsel, which writes official opinions for the Justice Department. With that background and perspective, Barr could be a brilliant choice to run the Justice Department. With public confidence in the Justice Department and FBI at the bottom of the barrel, Barr’s intimate knowledge of the inner workings of the department would allow him to begin the cleanup that is desperately needed. Another important point in Barr’s favor is that his tenure as attorney general was marked by an emphasis on breaking a cycle of gang violence that was beginning to take hold in the nation. That experience will prepare him for the challenges facing the country due to the encroachment of the MS-13 gang into our cities, violently competing with existing illegal drug distribution networks. In the private sector, Barr worked for GTE, which became Verizon, until his retirement in 2008. He then became a board member of Time Warner Corporation. Barr’s tenure at Time Warner included deep involvement in the legal wrangling between the company and the Justice Department over its still-contested merger with AT&T. The former attorney general has rightfully recused himself from considerations related to the problematic consolidation of media power that the AT&T-Time Warner merger represents. Normally in politics, situations are pretty cut and dried. Nominee A is a conservative or nominated by a Republican president, so conservative and limited government groups line up to support him or her. But as is seemingly increasingly true about virtually everything, the William Barr nomination is not so easy. A friend of Mueller will be responsible for overseeing the Mueller investigation – an investigation marred by partisanship and prosecutorial abuses from the outset, designed to take down President Trump. Mueller knowingly used Foreign Intelligence Surveillance Act warrants derived from Democratic research that was called by the then-FBI Director “salacious and unverified” as the pretext for much of its Russia probe. And the Justice Department was so committed to a partisan mission that officials deliberately turned a blind eye to very real concerns about the relationship of both former President Bill Clinton and his Secretary of State wife with both Russia and Hillary Clinton’s apparent violations of laws related to handling classified documents. As attorney general, will Barr excuse his old friend Mueller and former Justice Department colleagues, giving them a pass as just conducting business as usual? Or hopefully, President Trump has found the honest man who not only can shine a light on the corruption within the Justice Department but also has the guts and the legal gravitas to do something about it, becoming the swamp’s worse nightmare. Swamp master or destroyer? The Senate will have to confirm William Barr to find out which attorney general we are getting.